The Farr Out Family: We Bought a HOUSE!!! So, welcome to the tour of our home! After much bargaining and pleading we were finally able to close yesterday. We now have keys so you all can come and see whenever you have time. For now though a virtual tour will have to do. Here is the lovely master bathroom,,, don't ask me why this is first, I put the entry way first but it ended up last so we'll go backwards! 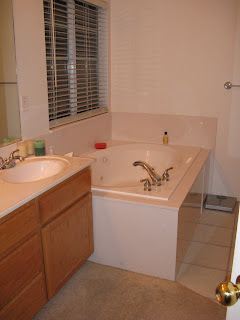 The master bathroom has a jetted tub--- ah man, now I have to take more baths! 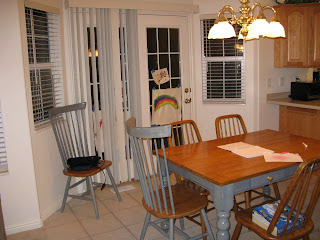 This is the lovely dining room. It is very open, which we love! 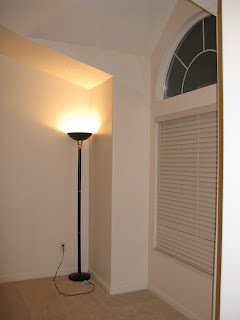 There are lots of windows so I don't have to turn on the lights during the day, how nice!! Also, they were going to throw their table in the trash can... so we said since we don't have a table we would take it... YEAH! 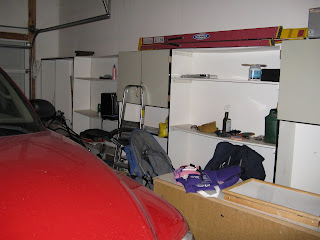 Here is the Garage. It is alot cleaner now, but all the shelves got to stay along with all the lawn equipment, and more. They had rented a UHAUL, filled it up, got another UHAUL trailer, and completely packed it, so needless to say they saved us some stuff. LUCKY! Now, here we start at the beginning. This is the entry way. It is very cute! 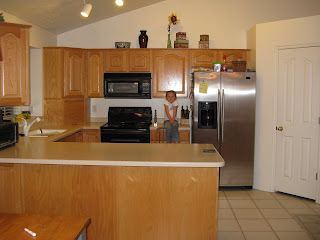 Here is our lovely kitchen. HOw fun! They left the fridge, washer and dryer. We are pretty much moving into a furnished house! We are both excited for the microwave. Our one now, when you pop popcorn in it the bag gets really stuck and then you have half burned half unpopped yummy! This microwave is bigger! WE are movin up! I thought Amy would really like this room. 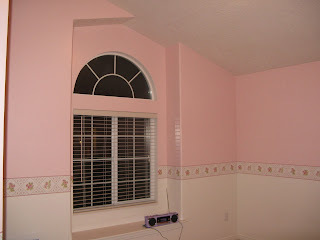 The people had a little girl so they have a pink room with a little bay window. Well, I guess when we have kids we better have at least one girl or we are going to have to repaint. I will say even though I don't like pink as much as Amy, I did like the room. 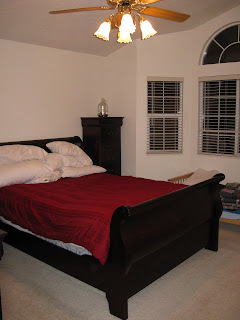 This was the master bedroom. We wish they left the bed, but thats ok he he he. I've spent lots of time dreaming up how to decorate!! 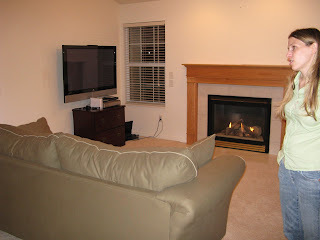 Here is the living room complete with fireplace. Sorry for the picture of the girl in it, thats the person we bought the house from, she stepped right as soon as I took the picture. Well thats all folks! We are very excited to move. We hope you all can come see us soon! Love you all! Congrats on the new house. How exciting to finally have a place of your own. I love the house!!! It is great! I had the grand tour yesterday. There's more stuff in the pictures than in the house now, but it is really really nice. (I'm a little jealous), but very excited for you both! I don't think I'll be jealous when the mortgage payments come through though! Oh, that is so fun! I love having a house. You don't have to worry about someone/landlord. I guess technically, the bank owns it, but we pretend that they don't exisit. I can't wait for us to go out there and see it. Love the House! Can't wait to see it! The pink room is cute too, now all you need is a baby girl to go in it! ha ha.